Braga is an ancient town around 40 minutes north of the city of Porto. A Porto airport taxi is the only direct way to reach Braga and it costs approximately 50€. 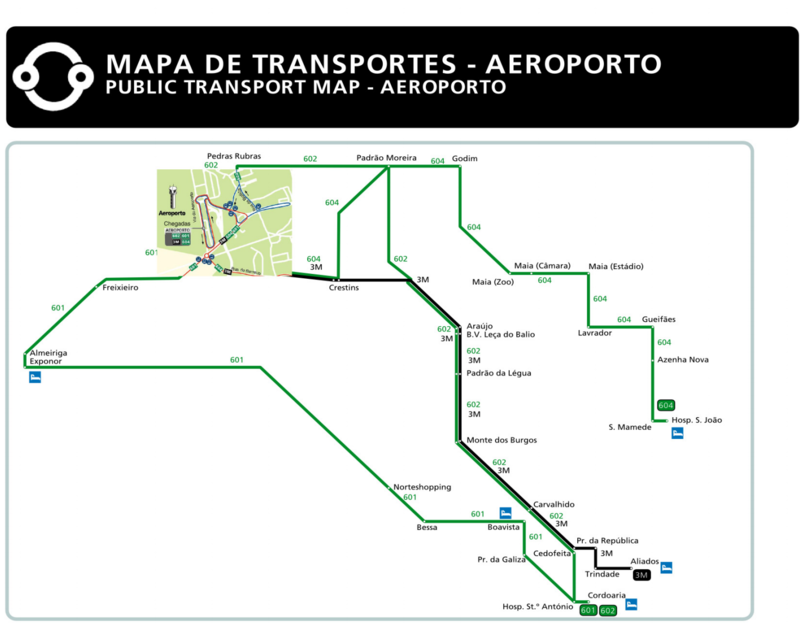 A train route is available from the central station - the most frequent leaves from Sao Bento station, but some also go via Campanha Station before the onward journey to Braga, and depending on the train will take around 40 minutes - 60 minutes and cost between 11.90€ and 14.50€. In order to get to the central station you will need to take the Metro or the bus from the airport into the city. Welcome Pickups offers meet and greet services and a friendly introduction to Porto at the same price as a regular taxi. Click here to see the cost. A Porto airport taxi is the most efficient and direct option to get to Braga. The taxi will take around 40 minutes for the journey. Taxis in Porto are modern and comfortable - and most are beige, but they can also be black with a green roof. The cabs have the green light on top when they are free for service. The taxis from Porto airport are metered, so under normal circumstances the trip should cost around 50€. However, this fare may be affected by night-time, weekends and holidays. These rates are in effect between 09:00pm - 06:00am as well as Holy Days and public holidays so expect to pay around 20% more if your journey falls within any of these times. Taxis provide modern, comfortable and efficient transport to Braga. They are available 24/7 and are the only direct method of transfer to Braga. However, taxis come at a cost, so to ensure that you pre-book to avoid the hidden costs. Porto airport provides no direct transport options via public methods to Braga. 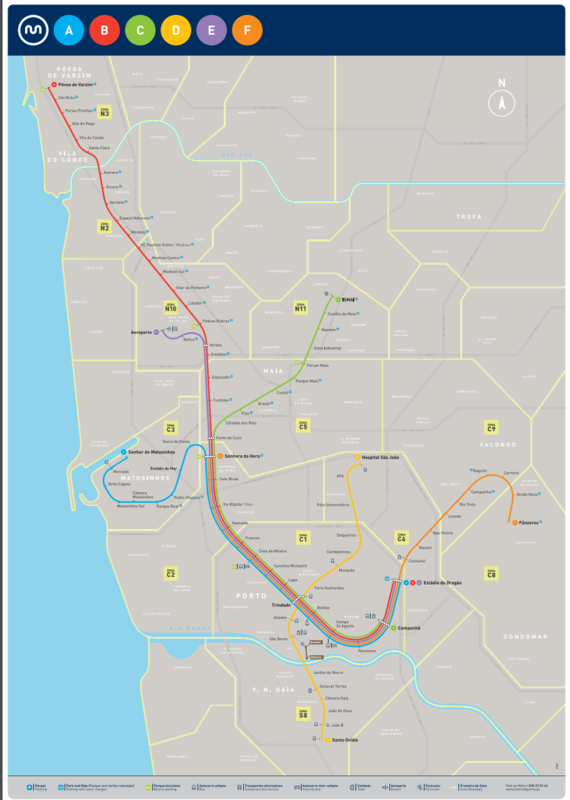 Many private companies operate this route via shuttle but the cost can be high. If you have large luggage, the driver can charge an additional 1.80€ per bag. It is best to have the name and address of your destination in Portuguese to avoid confusion. There is an airport pick up supplement fee of 2.50€ which will appear on the meter as you get in the cab. Braga trains leave from Porta Campanha Station or Porto Sao Bento Station, both in the city of Porto, on a regular basis, taking approximately 40 minutes to an hour depending on the bus you take. In order to get to the station you will need to take a Metro or a bus from the airport. The Metro will require taking the E Metro line from the airport, then a switch at Trinidade to take the D Line to Sao Bento Station or the C Line to Campanha Station. The bus lines 601 and 602 from the airport go close to Sao Bento Station, but you will need to alight at Carnio and walk for 5 minutes approximately. 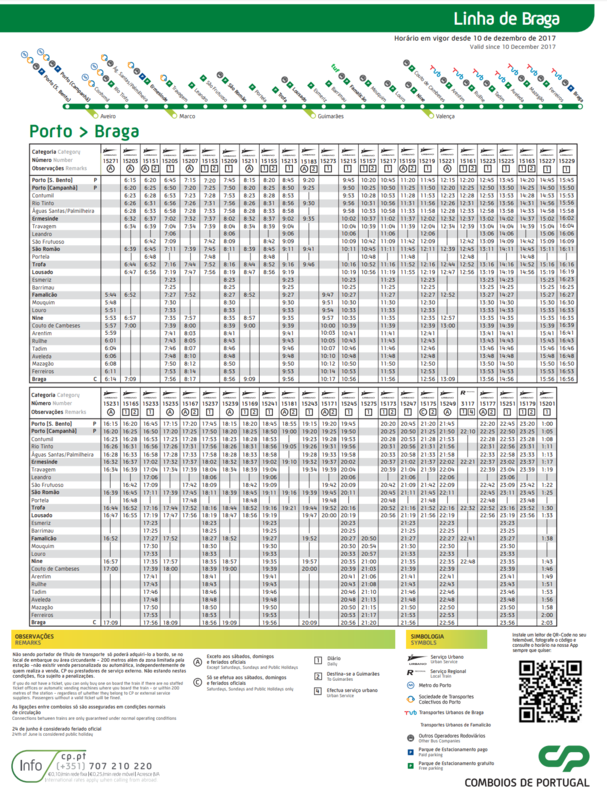 How much is the train from Porto Airport to Braga? The train cost varies dependent on how far in advance tickets are purchased and which train you take. On average the train will cost around 14.50€, yet the cost can be as little as 5€ for some trains. It is therefore very advisable to pre-book tickets via the CP Comboios de Portugal website to ensure the best deal available. There can be a 25 minute wait for the train. The train is available from 06:15am till 01:00am running approximately every 15 - 25 minutes. Weekends and holidays can affect these times. The train for Braga leaves from Campanha or Sao Bento Stations in Porto city, dependent on which line and time you select. Although the train to Braga from the station provides a cheap and quick journey, getting to the station from the airport via the metro or bus can add hassle and time to a long journey. A taxi provides a much more direct and simple transfer to Braga. Certain train times have cheaper rates than others and some are much quicker than others. The earlier you book the more guarantee you will have of securing a good price for your journey. Ensure that you leave yourself plenty of time to get from the airport to the station, especially when travelling with children and luggage. It is best to take the metro over the bus if you have luggage to avoid the walk from bus stop to station. Braga Station has a bus (number 2) that operates to the city should you require it once you arrive. If you book your tickets online, be sure to double check which station in Portugal it departs from. How much is a taxi from Porto Airport to Braga? The journey from Porto Airport to Braga is metered and therefore the fare is changeable. The journey should cost around 50€, but night-time, weekends and holidays will be charged at a higher rate. 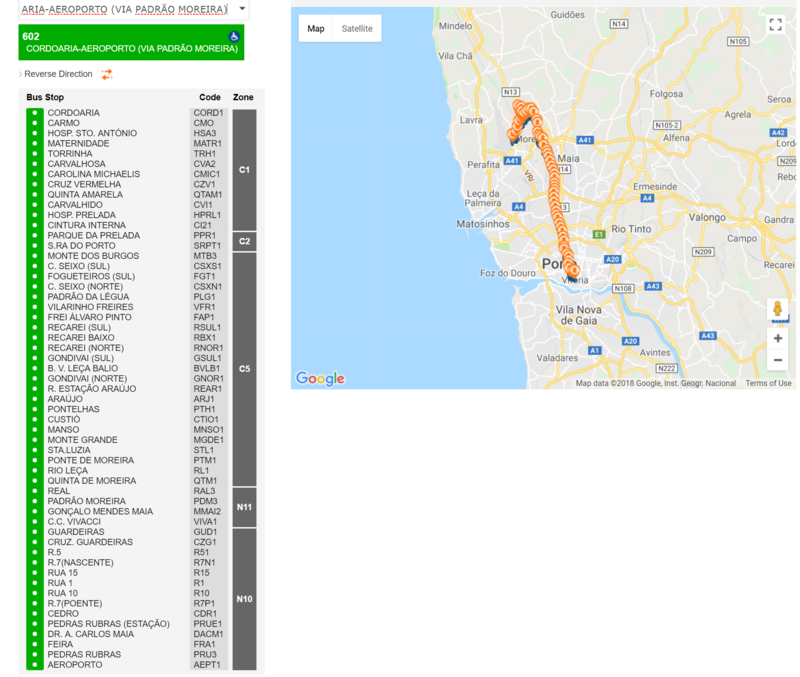 How far is Porto Airport from Braga? Braga is situated around 54.7km north of Porto Airport. A journey by car takes around 40 minutes. How many transfer options are there from Porto Airport to Braga? There is only one direct option from Porto Airport to Braga, this is by taxi. If you wish to take a public transport method, you will need to make your way to the central city of Porto to access the train stations there.